Little research has been done on pieces of art in the South that stems from West African religions into practices such as Voodoo and Gullah Geechee. In order to develop a well-rounded overall perspective of the art created in the 19th century in America, further research needs to be done on items that stem from West African religions and the Caribbean, and how they were incorporated into American lifestyles. Both voodoo and Gullah practices developed in the American South as slaves were brought into the major port cities. The slaves, who would be brought from different tribes in Africa, most likely would not have all spoken the same language; however they found ways to combine some of their religious practices into a language that was commonly understood. This practice of religion that spanned the language barrier became known as Voodoo in Louisiana, and Gullah Geechee in the Sea Islands. 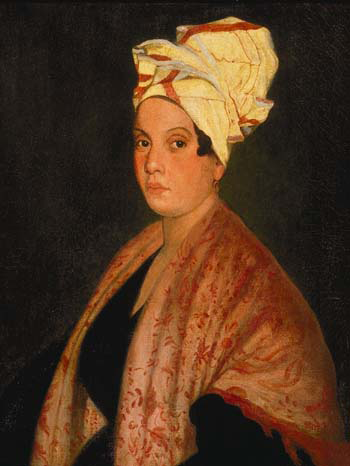 Marie Laveau, by Frank Schneider, based on a painting by George Catlin. Louisiana State Museum. This amalgamation of West African religions also occurred in Charleston, South Carolina, the site of a major slave trade port, and other smaller ports in the area such as Savannah Georgia. The coastal cities in the region called the “sea islands,” specifically Charleston, South Carolina and Savannah, Georgia, are rich in Gullah traditions that are evident in their histories and lifestyle. Signs of the belief in Gullah spirits, or “haints” appear throughout the city in the form of “haint blue” ceilings on the piazzas. [viii] Rituals and superstitions from West Africa and Gullah have influenced Charleston architecture and design choices, specifically in the piazzas. In Charleston, many of the piazzas are painted to ward off evil spirits by tricking them into thinking that the paint is a river, which the evil spirits would have been unable to cross. Many of the books I have found on the practice of Voodoo in New Orleans reference masks as having an important role in rituals, however, I have not found any museums or galleries with masks in their collection, other than the Voodoo Museum in New Orleans, which does not have photographs of their collection available online. There are also private collections such as the Grand Houmas House Plantation in Darrow, Louisiana that is said to have a Vodun mask on display, but there is no documentation that verifies that photograph. In conclusion, the practice of Voodoo and Gullah have deeply planted roots in the American South, however the lack of research dedicated to the subject shows a narrow-scope of interest in the category of American art. Further studied with documented photographs could lead to intriguing analysis of how the practices developed as they were brought into the Americas and the Caribbean. Studies on the practice of Voodoo would require care attention to finding the underground practices of Voodoo, not the commercialized stereotypical objects that are made and advertised to make a profit. Another avenue for future study could lead into a comparison of Voodoo and Gullah based on their geographic origins in order to see how they developed and what parallels that maintained. Brown, Karen McCarthy. Tracing the Spirit: Ethnographic Essays on Haitian Art. Seattle: Univ of Washington, 1996. Dorsey, Lilith. Voodoo and Afro Caribbean Paganism. New York: Citadel, 2005. Gershenhorn, Jerry. Melville J. Herskovits and the racial politics of knowledge. Lincoln: University of Nebraska Press, 2004. Johnson, Jerah. “New Orleans’s Congo Square: An Urban Setting for Early Afro-American Culture Formation.” Louisiana History: The Journal of the Louisiana Historical Association32 (): 117-157. Major, Clarence. 1993. Calling the wind: twentieth century African-American short stories. New York, NY: Harper Perennial. McInnis, Maurie. “Little of Artistic Merit? The Problem and Promise of Southern Art History.” American Art. no. 2 (2005): 11-18. Ravitz, Jessica. “Unveiling New Orleans voodoo.” THE SALT LAKE TRIBUNE, November 24, 2008. Staton, John. “Art exhibit’s ‘Haint Blue’ combines history, spirituality and fun.” Wilmington Star-News, , sec. Art, January 27, 2010. The Metropolitan Museum of Art. “Description: Masquerade Element: Ram Head.” The Metropolitan Museum of Art: The Nelson A. Rockefeller Vision From October 8, 2013. Thompson, Krista. “A Sidelong Glance: The Practice of African Diaspora Art History in the United States.” artjournal. no. 3 (2011): 7-31. Thompson, Robert Farris. Flash of the Spirit: African and Afro-American Art and Philosophy. New York: Random House, 1983. Pinksy, Mark. “What Walt Wrought.” Wall Street Journal, January 7, 2010. Ward, Martha. Voodoo queen the spirited lives of Marie Laveau. Jackson: University Press of Mississippi, 2004. Widmur, Ted. “The Invention of a Memory: Congo Square and African Music in Nineteenth-Century New Orleans.” Revue française d’études américaines, pp. 69-78 98 (): 69-78. Woller, Leta. “SPOTLIGHT ON THE COLLECTION January 2013: The Sorceress.” Birmingham Museum of Art. (accessed April 13, 2014). [i] JerryGershenhorn. Melville J. Herskovits and the racial politics of knowledge. (Lincoln: University of Nebraska Press, 2004), 83. [v]Karen McCarthy Brown, Tracing the Spirit. [vi]Jerah Johnson,.”New Orleans’s Congo Square: An Urban Setting for Early Afro-American Culture Formation.” Louisiana History: The Journal of the Louisiana Historical Association (1991): 117-157. [vii]Ted Widmur,. “The Invention of a Memory: Congo Square and African Music in Nineteenth-Century New Orleans.” Revue française d’études américaines, pp. 69-78. [viii] John Staton, “Art exhibit’s ‘Haint Blue’ combines history, spirituality and fun.” Wilmington Star-News, , sec. Art, January 27, 2010. [x] McInnis, “Little of Artistic Merit?”11. [xi]Pinksy, Mark. “What Walt Wrought.” Wall Street Journal, January 7, 2010.